She was kneeling before her remains in Rome and the prayer was one of expectation. The woman at the foot of that altar was in need, and the other woman whose saintly body has rested there for hundreds of years, is a powerful helper of the needy. Somehow, the convergence of need, prayer, expectation, and powerful intercession resulted in what we can call a modern miracle. The Doctor is Saint Catherine, venerated as Doctor of the Church for her great virtue and faith, and her philosophical and theological contributions. That Sienese maiden turned advisor to popes, mystic, and venerable proponent of the mercy of God and His abundant providence, died when she was only thirty-three. 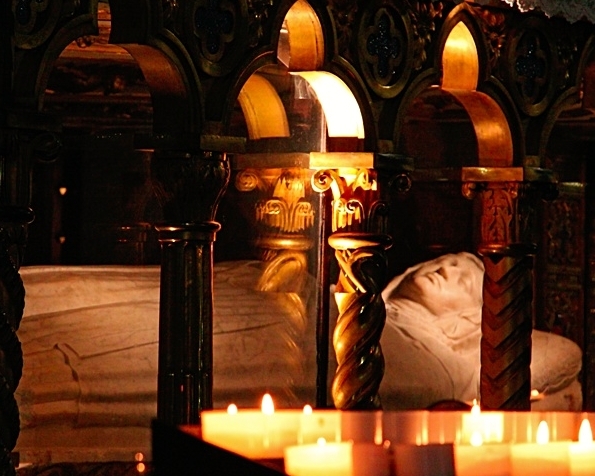 She never married and lived a consecrated life as a lay woman and Dominican in the late 14th century. In that short lifespan she converted countless hardened hearts, courageously advised two popes, brokered agreements comparable to the more complex international peace treaties of our day, and though illiterate, she dictated countless letters and thousands of lines on the provident love of God. She founded a community of women who attended to the sick during the ravaging outbreak of the Black Death in Italy, tending herself their contagious wounds. She bore in her body the hidden wounds of the Lord on the Cross. Seen through a modern lens, hers was one modern life. She lived as virgin, spiritual mother, diplomat, theologian, and philosopher. By modern standards of power she was one powerful and courageous woman in her time, and ahead of it. In death her work did not end. For all the things said and written of the great Saint Catherine of Siena, countless more remain hidden and unknown. Among them are many great acts of saintly intercession; the kind of intervention that is so shocking, as it revives lost innocence, re-ignites faith, and sets captive hearts free. She continues to work wonders. Six hundred years later, someone her age appealed to her by virtue of her almost daunting virtue and greatness, and she acted with the same powerful determination—an intercession before the God who in life had been her strength and courage. Here is one of those unknown stories. Only a few weeks would pass, and in the order of things invisible, impossible, and yet all true, that oration by her tomb resulted in the miraculous existence of another soul, a hidden life, and with it a new and long-awaited maternity. This is the kind of thing that can only be told of with the wonder proper to what is impossible to explain in human terms, and remains hidden in the heart of God. The holy Doctor has a daughter, in Maria Caterina, — the child of our marriage that was her gift in response to a prayer offered at her altar for a long-awaited ‘soul’. It was a prayer heard and answered literally; this little soul lived hidden on earth for a brief while, and then God called her to Himself. One Saint, one prayer, one child, one mother, one miracle of love. It is difficult to measure the eternal impact of one saintly life. In the realm of things we try to explain and understand, the links are clear and yet also mysterious. Amazingly, she who so loved Providence, and yet who had no natural children of her own, becomes the saintly bearer of such blessed and maternal abundance. Such it seems, is the exchange in the economy of grace: for one’s virtue, confidence, and sacrifice, another, many centuries later receives in overflowing measure. And it is so, that through merits not our own, we learn to love the One who inspires such heroic love in the first place; we learn to love Love. In her Dialogues, Saint Catherine offers insights on the tremendous significance of the Incarnation. Christ, being God, and taking on our flesh, becomes the bridge between heaven and earth. That Bridge still unites souls with their Father, and hers is a spiritually maternal hand, modernly inviting us to make a crossing. –Catherine of Siena, Dialogues on Divine Providence. In the Catholic Church today is the feast of Saint Catherine of Siena. It turns out she is also the patroness of expectant mothers, who appeal to her for the grace of healthy pregnancies. Perhaps one day she might also be called the saint of hidden maternity. Meanwhile, the Holy Doctor and her daughter, our daughter, are joined in that place of beatitude and peace; one saintly life and an innocent hidden life– and from them springs a thoroughly modern love of Love, a thoroughly modern gratitude. It makes sense: Love begets love, and the Incarnation continues to effect wonders in expectant hearts.